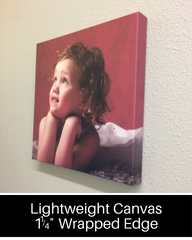 Canvas Photo Prints and Canvas Banner Wall Hangings - printed on high quality satin canvas material, sprayed with a UV protectant coat and stretched in-house by our canvas professionals. In honor of the stars and stripes, all of our canvases are made in the USA. We ship FREE from our headquarters in The Mount Rushmore State, South Dakota and have discounts available for Local Pick-up. We print our canvas photo prints and canvas banner wall hangings on a high-end HP wide format printer. Ordering is simple! 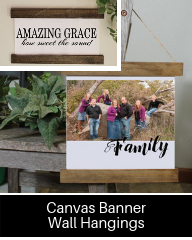 Choose from pre-designed art prints or upload your own photographs; just choose your canvas style (Lightweight Canvas Photo print, Heavy Duty Canvas Photo Print or Canvas Banner Wall Hanging), upload your pictures or art and add to cart! We can customize any photo to fit your canvas needs. 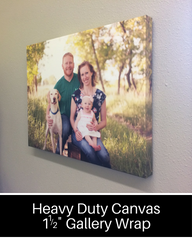 We can't wait for you to see the quality of our canvas wraps and wall hangings!